As I’ve discussed in previous articles, both Carl Jung and Joseph Campbell encourage us to discover our purpose in life – or to glean meaning – through the archetypes which are revealed to us in the stories we hear; the novels we read; in our dreams; and the shows that we watch. These two great thinkers suggest that human beings are biologically hardwired to understand the symbolism and expression of character archetypes. These archetypes are consistencies observed throughout the world and all times, providing meaning to otherwise individual experience. We recognize them, and we understand them. Our reactions to the characters in these mythical dramas offer unique windows to our soul, and a chance to work with the “Shadow” side of our psyche. Are you willing to tune in to aspects of the self that are ready to be discovered? I’m a big fan of Game Of Thrones, for example. I typically avoid exposure to violent content – I don’t want to ‘adapt’ or accept violence in my life. But in Game Of Thrones, there is so much more. Every major archetype is explored and exposed in this drama series. There are righteous Kings, wicked Kings, altruistic Kings, and immature Kings. There are old Wise Ones, young Wise Ones, budding Wise Ones. There are Martyrs, Lovers, Jesters, Warriors and Innocents. And many more. One of my favorite characters is Daenerys Targaryen, the young, wise Queen of Dragons, and the woman who wants to rule the seven kingdoms. The female hero can fit into the traditional Hero’s Journey—we prove that Daenerys’ experiences match up quite nicely here—but the lack of ancient questing female hero myths forces us to construct our archetype more from the old idea of the great goddesses. Joseph Campbell recognized this necessity. The Hero archetype isn’t just born. They evolve through other archetypal stages. The Hero’s journey, like all journeys, begins with Innocence. The achievement at this stage is the ability to gain others’ trust and optimism because of their endearing innocence. The next stage is the Orphan. Daenerys has no desire to join her brother’s wish for power after her parents died. But the orphan wishes to regain safety, away from King Robert’s assassins, yet they also don’t want to be exploited. Though her path was thrust upon her, she found her protector in Khal Drogo, the leader of 40,000 Dothraki warriors, in return for the use of his warriors in invading Westeros. She also eliminated her exploiter (her brother). But when she succumbed to her destiny, she discovered her own Warrior spirit. She discovers she is the Queen Of Dragons, and is determined to fight for her new goal – To claim her title of Ruler of the seven kingdoms. As the Warrior discovers his/her competence and power, the Caregiver emerges, moved by compassion, generosity, and selflessness to help others. She freed slaves! But the caregiver and rescuing others, in and of themseves, weren’t enough. Daenerys took her responsibilities to the next level, embracing the archetype of the Righteous Ruler – Not the power-hungry, self-centered and entitled type of Ruler. But one who embraces all the prior journey’s wisdom, of caring, of being willing to be a warrior for what is “right”. As her journey continues, what other archetypes will emerge? Stay tuned! What characters do you relate to? What do these characters reveal to you, about your place in your current journey? Do you ever feel overwhelmed but don’t know why? Or feel “odd” but can’t make sense of it? Try drawing… nothing in particular, just let the pencil move across the page. Then do another page. Try it using your non-dominant hand – crazy… I know. Clarissa Pinkola Estés wrote the bestseller “Women Who Run With the Wolves” , where she interprets old folktales to reveal the archetypal wild woman. These qualities, she says, have today been dangerously tamed by a society that preaches the virtue of being “nice.” The book appeals to women who want to find more meaning in life. We describe life in metaphors. In order to truly reach our potential as unique human beings, we must face our Demons – those parts of Self that don’t feel very respectable; the parts you’d like to disown; those aspects you do not want to accept about yourself. Carl Jung coined the term “The shadow” to describe our demons. It’s the unconscious composite of self that has been repressed, suppressed or disowned. Our shadow often has both positive and negative aspects. For instance, the shadow of someone who identifies with self as being kind may not be able to see when he or she is being harsh or unpleasant. And a person’s shadow can have hidden positive qualities that have been repressed. The shadow of a person who perceives himself to be unfeeling may not see that he or she can also be tender. 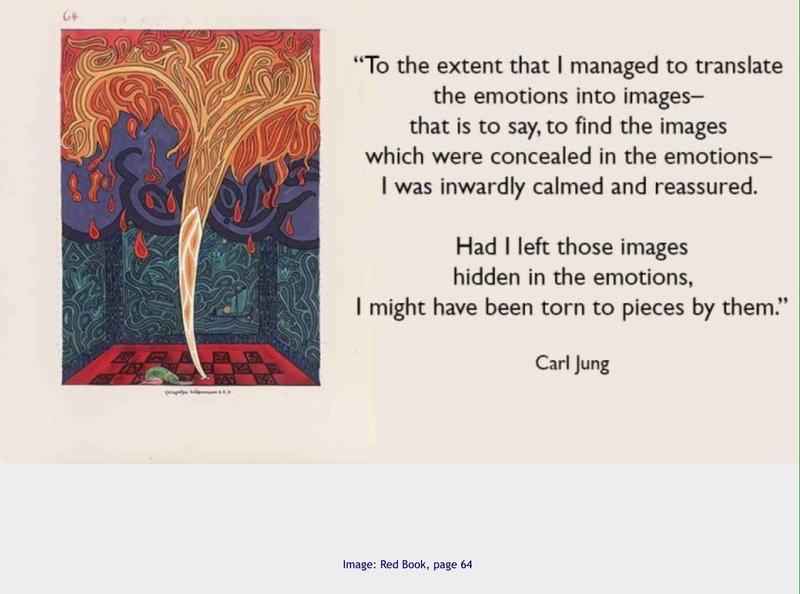 Jung described the unconscious is an active part of the normal human psyche, and that “neurosis results from a disharmony between the individual’s unconsciousness and the higher Self”. The first task on the path to your potential happens when you become aware of your inner states of being – your motives, emotional reactions, and patterns of thought – as you experience the world around you. If you look into your own life, you will notice that your beliefs and expectations, many of them formed in early childhood, skew your experience of reality. And the effects of cultural, historical, and environmental influences may be beyond our individual ability to control. But many of those influences can be challenged. It begins with awareness. Becoming aware is enormously important in freeing you from these patterns, but awareness will not, by itself, remove them altogether. At the level of daily living, these insights do not “fix” the old patterned emotional tendencies. You still have the same difficulties in your relationships, the same tendency to confirm what you think you already know, and drudge on, wishing it would all change. Only by learning to investigate and integrate our unconscious patterns of thinking and feeling can we become whole and end our imprisoned patterns that cause most of our suffering. We must stop pushing away moments of discomfort, but instead welcome them as opportunities to see into and eventually through the unexamined aspects of self that have been driving us. Making the unconscious conscious is a radical kind of responsibility for the self, and the only true path to freedom and authenticity. Our supposed demons have their own gifts and challenges. But the perfect way to tame each of them is by learning to understand them, appreciate their message, and give them the simple things they need. As soon as these parts of self feel understood, they tend to no longer threaten us. They become assets instead of liabilities. Psychotherapy can help you learn to transform these unconscious energies into snuggly beasts. I haven’t met a client who didn’t love themselves more after meeting their demons with understanding. Maybe a therapist can help you, too. “The idea of karma is that you continually get the teachings that you need to open your heart. … The lessons will keep coming until you get the message. “…There is so much beauty in the world.